Saint-Bris is the only appellation in Burgundy where the obligatory white grape is Sauvignon Blanc. 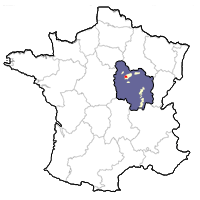 The commune of Saint-Bris lies about 15 kilometers southwest of Chablis and seven kilometers southeast of Auxerre in the Yonne département (89). The name of the village, Saint-Bris, comes from the name of the Christian martyr, Sanctus Priscus(Saint Prix in French). His name was attached to the village until after the French Revolution when it became Saint-Bris. It was finally changed to Saint-Bris-le-Vineux at the beginning of the twentieth century. Back in the 14th century, the village was fortified by a surrounding wall with 17 towers. Today only the gate remains. There still exists a network of tunnels linking the cellars and the houses together, which enabled better defense and escape when the village was under attack. The castle in the center of the village, next to the church, is more recent. It was built in the 18th century. Today it belongs to the village council and is used as the local primary school. Monks have cultivated vines in the village since the first century AD. By the 12th century, there were nearly 1,100 hectares under vine, with over 450 wine growers. Nearly all of these vines were knocked out when phylloxera louse ravaged the vineyards at the end of the nineteenth century. Five hundred and fifty hectares of vines surround the village of Saint-Bris-le-Vineux now. Normally these vines are planted on the flatter ground or plateau formed by Portlandian limestone from the Tithonian age. Saint-Bris was considered a VDQS after 1974, and in 2001 finally gained appellation status for theSauvignon Blanc grape.